The idea was forming, the structure underway, but now a space was needed to bring this idea to fruition. My friends told me about Northeast Minneapolis and the plethora of empty studio spaces and warehouse buildings throughout. There weren’t as many resources for finding vacant spaces at the time, Craigslist being a total crapshoot. I remember driving through the streets of Northeast, jotting down numbers and addresses, leaving a lot of messages, and getting a lot of disconnected signals. I called a number posted on a brick building along Quincy Street and set up an appointment. I met the building owner outside on cold and blustery January morning. Welcome to Minnesota winter! We walked upstairs into a space that was filthy, frigid, and, in my optimistic eye, bursting with potential. Another enticing factor: rent was also real cheap. After we walked around the building some more we ventured onward and outward. The owner showed off the neighbor’s space, a giant empty warehouse that would be the future home of Uppercut Boxing, a women-owned boxing gym. “Yeah, a woman bought this space and will be fixing it up. She plans to have a bunch of women’s health services here. Yoga, vitamins, all that jazz.” I sensed he was trying to play up the building and neighborhood, but it still sounded pretty great! We returned outside and walked around a bit more while we chatted. “Yeah, this is a pretty good spot for an arts studio,” he said. “You should see this space in May. During Art-A-Whirl it’s a sea of people, you can barely walk between the buildings. Thousands and thousands.” I signed the lease, and the deal was done. 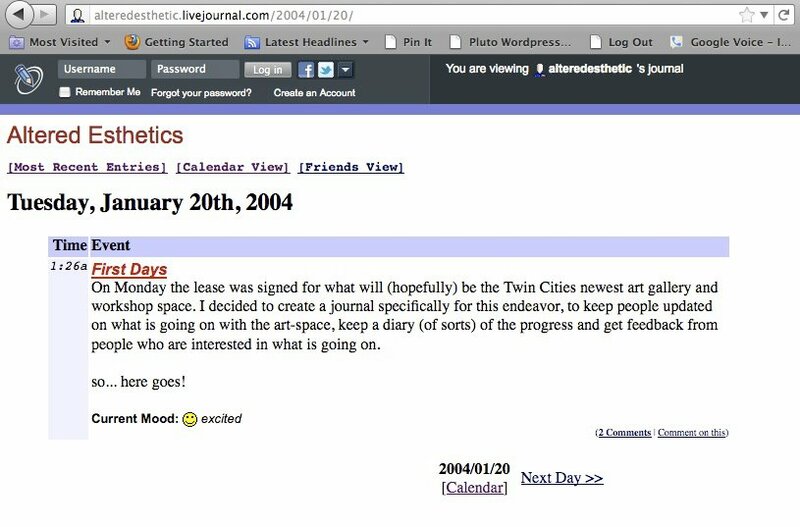 An entry from LiveJournal in the earlier days. Note the 1:26 a.m. time. Wouldn’t be my first nor my last late-night work session. Our location in Northeast was important to the context of the gallery’s story, but so was our activity on Quincy Street itself. Quincy Street is an artery into the Northeast Minneapolis Arts District and one of the oldest streets still in the neighborhood. The pavement worn and traveled, the old red brick comes up through spots of tar that gradually weathered away. The road is seeing much more traffic now, with not one but two breweries along the block, bookending the art buildings between. Even before the newer breweries came along there were other significant Minneapolis businesses located on Quincy Street, including James Page Brewing Company and the Minnesota Spoken Word Association. Beyond the train tracks, one street over, you can see the Northrup King Building and its iconic water tower, which is for many a symbol synonymous with the Northeast Arts District itself. The Quincy Street Studios building, where Altered Esthetics’ first home was, is easily recognizable by its hanging fish sculpture created by artist Tiny Proctor. A two-story brick building, it was located in between the Architectural Antiques building to the north and the Q.arma building several doors south. Apparently that two-story row of buildings used to all share the same heating system, long ago when the buildings were under one owner. On the other side of the road was Kurt Manufacturing, a low and wide industrial space flanked by the General Mills factory behind it. Art-A-Whirl is Northeast’s open studios tour, and while the owner of 1300 Quincy might have been overselling it a little at the time to get the space rented the future definitely held to that promise. I signed a lease and immediately began fixing it up. The original colors of the space were peach and mint green, like an ’80s wedding color theme. Over the next three months I went there daily, cleaning and scrubbing every square inch of space and painting the ceilings, walls, and floors. At first glance, the studio space for Altered Esthetics didn’t look like much. But I have fond memories of that winter, listening to Joy Division ad infinitum as I painted the walls and ceilings, sanded and prepped the floor, and cleaned the hell out of a bathroom that looked like it had never seen a sponge. Shelves were built, walls were constructed, and clip lighting rigged for artwork. My monster-movie inclinations came through in the original painting style. The exposed brick was painted with blacks and grays. The hippies that had used the space before me had left incense sticks drilled into holes in the wall, which I bloodied with dripping paint. To match, I found a perfect maroon stain for the doors. The motif was macabre, but it made sense, especially as the initial plan was it for it to be a mix of community gallery space and private studio. It became much more. My friends that originally welcomed me to Minneapolis were a big help with all of this. They joined to help put up walls, carry lumber up the stairs, and paint. At night, we would hang out circled around a space heater in lawn chairs like it was our little indoor campfire. The space was a series of three rooms: a larger main gallery space, an adjoining officesized space, and a raised back area with a drain in the middle that we turned into a storage room. There was this weird partition wall between the larger gallery space and the middle office-like space. It had a window in the upper portion of the wall that for some reason was coated in some sort of spackle. We drank champagne while diligently scrape-scrape-scraping all the spackle gently off the window until it was completely clean, all the while chatting about art, music, and possibilities. I procured a copy of A Guide to Starting a Business in Minnesota and read it cover to cover. I registered as a DBA, took out an ad in Finance and Commerce, and started a rough business plan. I talked to friends working in gallery spaces back home and made some new friends in Northeast as well. Finding that first space was a mix of luck and circumstance, and Northeast Minneapolis was a solid first home and a great place to grow. What if I had been directed to Lowertown, St. Paul? I could have been equally enamored. But fate pointed me to Northeast, and to Northeast I went. Hindsight being 20/20, I learned a lot about the “location, location, location” rule the hard way: a second-story space tucked away on a street with low traffic did not make for high visibility. However, it allowed the intimate, creative space needed to try this idea. And as it turns out, some of the best spaces are the less obvious ones—tucked away, a little out of view. I was young, energetic, optimistic—with no previous experience running a gallery, and entirely no business starting one! Altered Esthetics hosted three exhibitions that first year: The Art of War, Level_13: Video Game Art, and L’Art Mort. Each exhibit was more fun, each a little more professionally executed and with a continually growing number of artists—the average number of participants tripling from sixteen to forty-eight within two years’ time. About halfway through 2004, with things at the gallery operational and my meager savings mostly depleted, I began looking for a full-time job. From that point on, Altered Esthetics was done largely in addition to whatever I was doing for work. Did you ever read that Onion headline, “Find the Thing You’re Most Passionate about, Then Do It on Nights and Weekends for the Rest of Your Life”? That was me, living the dream! This post is adapted from It’s Never Going To Work: A Tale of Art and Nonprofits in the Minneapolis Community with illustrations by Athena Currier. Post graphics by Jamie Schumacher. ©2018 Jamie Schumacher. It’s Never Going To Work is a light-hearted, illustrated book that offers real-life insights on founding a community space and nonprofit. It provides tools, tips, resources, and camaraderie to community organizers and anybody attempting something new.